When you think about the world’s cheapest places to live or retire, you probably think first of Latin America or Asia, writing off Europe altogether, figuring no way someone of modest means could ever afford to move to the Old World. For most of Europe, that can be a reasonable perspective. But Portugal, especially the Algarve, is an exception. Living here, you could embrace the best of a Continental lifestyle even if your budget is what might be described as ideal for the developing world. The Algarve is legitimately one of the cheapest places in the world to live—and live well—today. You could rent an apartment for as little as 500 euros per month; for 700 euros per month you could rent something very nice. You could live on as little as 800 euros per month in addition to whatever you’re spending on rent. In other words, you could live or retire in the Algarve with a budget of 1,300 euros per month or less. That translates today, thanks to the down-and-out euros, tonot much more in dollars. The even better news is that this budget buys a standard of living that has nothing to do with scraping by or making do. Living in the Algarve, even on a limited income or a retirement pension, your days could be filled with diverse and engaging activities, your evenings spent enjoying dinners out with friends. During a recent visit to 15th-century Lagos, one of my favorite destinations in the Algarve, in the city’s lively old town, crowded with tourists that day, we stopped at a café on the main square. The menu offered a hamburger for 2.80 euros, a small pizza for 3 euros, and sandwiches for not much more. Not fine fare, but this is tourist central. When I commented on the surprisingly low prices to a traveling companion, a native Portuguese, he was confused. How could a restaurant hamburger be cheaper than 2.80 euros? One practical advantage of life in the Algarve is that you can get by without either heat or air conditioning much of the time, and some properties are equipped with neither (though fireplaces aren’t uncommon). It’s a question to ask when shopping for a place to live as you might appreciate the ability to raise or lower the temperature of your home now and then, but, most of the year, you’ll live comfortably without these expenses. Figure 75 euros per month on average for electricity, including some air conditioning. In addition, budget about 70 euros per month for the combined expenses of phone, internet, and cable TV, which can be purchased as a bundle. 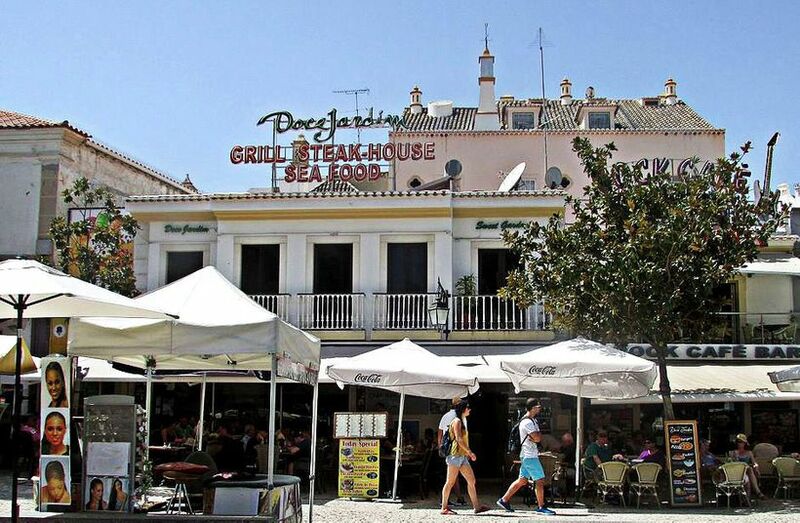 Considered more broadly, eating in the Algarve is one of the greatest delights of living here and also one of the best bargains. I’ve enjoyed some of the best meals of my life in the Algarve. Menus feature prawns bigger than lobsters I’ve known and every other kind of sea creature you can imagine, all fresh from the ever-present sea and available for rarely more than 25 euros a meal. A chilled glass of Prosecco is as little as 3 euros. Avoid restaurants with menus in multiple languages, as these places target the foreign tourist market. If you want authenticity at a low price, look for pratos do dia (dishes of the day) signs scribbled on blackboards or papers taped near restaurant entrances, priced from as little as 3.50 euros. Staff in these places can be an exception to the rule that nearly everyone in this region speaks English, but you can get by with sign language, a phrasebook, and a friendly smile. Of course, you could spend much more than 3.50 euros for a meal out, as this coastal region boasts five-star restaurants, too. Eating in can be an even greater bargain. Depending how often you choose to dine out rather than cooking at home, 200 euros per month per person should be a comfortable food budget. This is where the Algarve really shines, no matter how you like to spend your time. You could enjoy many pleasant days walking around cobblestoned towns and villages, window shopping then stopping at outdoor cafés for a coffee or a glass of wine. Castles, fortresses, museums, and small theaters charge 3 euros per person entrance fee on average. Old harbors, medieval fountains, gardens, and historic churches are all accessible at no cost. You could fill yet more pleasant days hiking in the countryside or wandering the long beaches. Cliff walks, beach combing, and bicycling, too, are no cost. Keep a car, and this whole coast is your playground. Day trips to Sagres, Silves, Carvoeiro, Ferragudo, and beyond could fill many afternoons or long weekends. The sun shines year-round, and temperatures are rarely too hot or too cold to keep you from setting out to explore the many old-town squares or the great outdoors. An entertainment budget is 100% controllable anywhere but perhaps especially so in this region where you have so many options for zero-cost ways to spend your time. If you want to dine out two or three times per week and see the occasional movie, figure up to 200 euros per month per person. Beyond these basic expenses (utilities, food, and entertainment), you’ll have the cost of health care (which can be zero if you’re a legal resident and register for the public system), the cost of furnishing and keeping your home (be it a rental or a place of your own), incidentals (dry cleaning, haircuts, etc. ), and the cost of keeping a car if you decide you want one (you probably will; public transportation isn’t a strong suit in this region). Right now all costs are more affordable than they’ve been in a long time for Americans in this part of the world thanks to the strong dollar (or weak euro, depending how you look at it). What if the euro rebounds? That is, what if you move to the Algarve to take advantage of today’s exchange rate, but the euro gains 20%, 30%, 40%, or more on the dollar? If you’re living on a fixed or modest income, aren’t you setting yourself up for a problem? Buy a place of your own at today’s favorable exchange rate. You could find something on the Algarve coast for the equivalent of US$150,000 or less. That locks in your housing cost. Given the overall low cost of living, even with a modest nest egg, you likely could set a little aside each month. If the exchange rate were to move against you (as, yes, it could), your cost of living would increase in dollar terms, but with decent savings and the fact that you’re living in your own digs and therefore rent free, you could hopefully handle that shift. Housing is typically the lion’s share of any budget. Reduce your housing cost to nothing (by paying for your own home in full at today’s very favorable exchange rate), and you’re well positioned to ride out future currency movements not in your favor.